Soam said iconic landmarks such as a digital hub, boutique hotel and a convention centre will set The Light apart from other waterfront developments on the island. 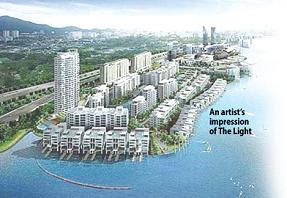 The Light, which is a RM5.5 billion mixed development project, is being carried out on reclaimed land north of the Penang Bridge. What happen now. it start and stop again on the main building. Works only on the smaller building.